If I knew now what I knew my first time practicing yoga back in the 90s, I would have saved so much money on the yoga mats I thought were good. I used to have a closet full of mats that never held up very well. Everyone has individual needs and preferences when practicing yoga; but comfort should be the number one priority. A mat is one of the most important tools when practicing yoga. You don’t want to feel your knees digging into the floor during downward dog, or like your participating on the slip & slide at your son’s birthday party! These are a few mats that I find extremely supportive, comfortable and helpful when practicing all types of yoga. Gentle Flow- Move through a gentle vinyasa flow! Side Plank- Test the length of your mat and the stretch! Comfort is everything – especially when it comes to yoga! The Manduka is made with a dense foam. Which makes it much more comfortable and supportive to practice on, compared to your average mat. Grip is great! The grip on this mat consistently gets better with every use so that you’re never slipping & sliding around the mat and every movement is able to be done with greater ease. The length of this mat is so convenient and easy. 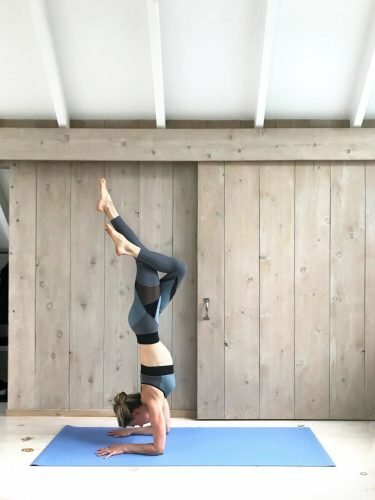 It allows for different poses and motions instead of having to readjust yourself on the mat for every pose. These watercolour mats are made with a natural, tree rubber giving it a suede like feeling that differs from the average mat. The mat offers a cozy & relaxing vibe for your day to day practice. Each design for each yoga mat is completely original which really gives a personal feel to your yoga experience each time you use it. The natural rubber is a benefit for gripping however doesn’t have that strong rubber smell when new because of the equal amount of cushion built in which is nice. As a mom time is everything – this mat is machine washable making it easier to toss it in the machine instead of having to take extra time to hand wash it. Another bonus with this is that the fun prints never fade! This mat also offers a two in one design where the mat itself acts as a towel to get sweat and keep from slipping which is always a plus. A good yoga mat can take your practice from great to amazing! Let me know what your favorite mat is in the comments!